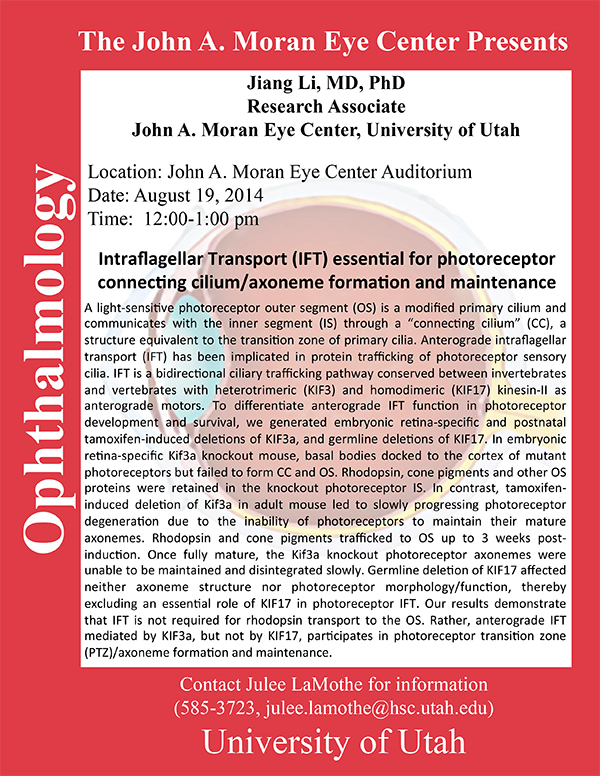 Jiang Li will be delivering a seminar, Intraflagellar Transport (IFT) Essential For Photoreceptor Connecting Cilium/Axoneme Formation and Maintenance on Tuesday, August 19th, 2014 in the John A. Moran Eye Center auditorium. A light-sensitive photoreceptor outer segment (OS) is a modified primary cilium and communicates with the inner segment (IS) through a “connecting cilium” (CC), a structure equivalent to the transition zone of primary cilia. 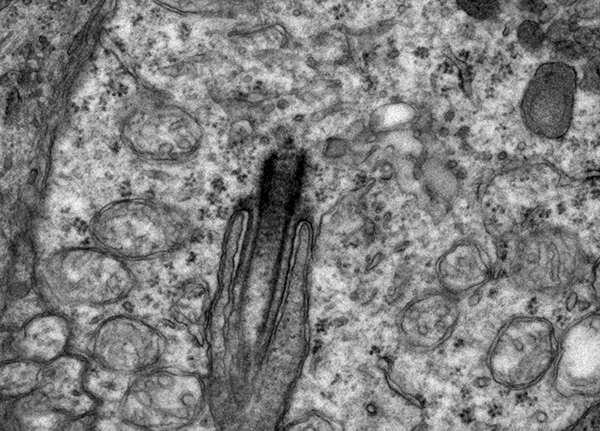 Anterograde intraflagellar transport (IFT) has been implicated in protein trafficking of photoreceptor sensory cilia. IFT is a bidirectional ciliary trafficking pathway conserved between invertebrates and vertebrates with heterotrimeric (KIF3) and homodimeric (KIF17) kinesin-II as anterograde motors. To differentiate anterograde IFT func,on in photoreceptor development and survival, we generated embryonic retina-specific and postnatal tamoxifen-induced deletions of KIF3a, and germline deletions of KIF17. In embryonic retina-specific Kif3a knockout mouse, basal bodies docked to the cortex of mutant photoreceptors but failed to form CC and OS. Rhodopsin, cone pigments and other OS proteins were retained in the knockout photoreceptor IS. In contrast, tamoxifen- induced deletion of Kif3a in adult mouse led to slowly progressing photoreceptor degeneration due to the inability of photoreceptors to maintain their mature axonemes. Rhodopsin and cone pigments trafficked to OS up to 3 weeks post- induction. Once fully mature, the Kif3a knockout photoreceptor axonemes were unable to be maintained and disintegrated slowly. Germline deletion of KIF17 affected neither axoneme structure nor photoreceptor morphology/function, thereby excluding an essential role of KIF17 in photoreceptor IFT. Our results demonstrate that IFT is not required for rhodopsin transport to the OS. Rather, anterograde IFT mediated by KIF3a, but not by KIF17, participates in photoreceptor transition zone (PTZ)/axoneme formation and maintenance. With the exception of a few types of cells, (acinar cells, T lymphocytes and hepatocytes), every cell in your body has a cilia. In the vision community, we are used to seeing these structures in the distal portion of the photoreceptors. The reality is that every cell in the retina has a cilium and some cells use the cilia as a means to expand a very specialized function like the photoreceptor outer segment or the hair cell or the respiratory epithelium of the lung. 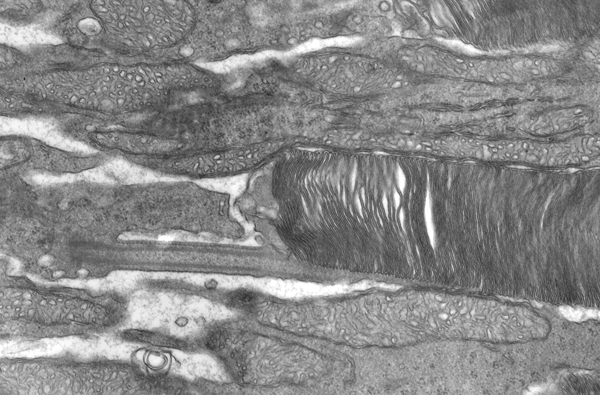 This particular cilia was found in an amacrine cell in a rat retina. Cilia were thought for a long time to be vestigal organelles that are formed in development, then left over after the developmental process ended. Prachee Avasthi Crofts in the Wallace Marshall laboratory notes that “cilia are signaling centers capable of sensing a variety of extracellular stimuli: fluid flow in the kidney, odorants in olfactory neurons, and hormones in the satiety center of the brain. Motile cilia in the trachea and brain ventricles can also generate flow of mucus and cerebrospinal fluid respectively. Dysfunction in conserved ciliary structure and function therefore results in a variety of disorders (termed ciliopathies) which include polycystic kidney disease, anosmia, obesity, bronchiectasis and hydrocephalus, to name a few. In the retina, the outer segments of photoreceptors that sense light are in fact modified sensory cilia with conserved mechanisms of formation and maintenance. Thorough characterization of phototransduction proteins that reside in the outer segment as well as rapid turnover of outer segments to recycle spent membrane and protein make this system an excellent model to study cargo transport within cilia. Furthermore, a hallmark of many pleiotropic ciliopathies is retinal degeneration that results from abnormal photoreceptor cilia function. Investigation of photoreceptor cilia dysfunction can yield much insight into generalized mechanisms of cilia-related pathogenesis and potential avenues for therapeutic intervention”. In the retina, the applications being explored by a number of labs including Jun Yang’s laboratory here at the Moran Eye Center and by a recent student who’s work on Senior-Loken Syndrome in Wolfgang Baehr’s laboratory. This is in addition to a number of labs throughout the world including Joe Besharse at the University of Wisconsin Madison, and Uwe Wolfrum at the University of Mainz, David S. Williams, University of California Los Angeles, Marius Ueffing, University of Tübingen, Eric A. Pierce, Harvard Medical School, Gregory J. Pazour, University of Massachusetts Medical School, Nicholas Katsanis, Duke University, USA, Tiansen Li, NEI and many others.